On 3 January the colour of the 1st Class Definitive will change to the official ‘Royal Mail’ Red. 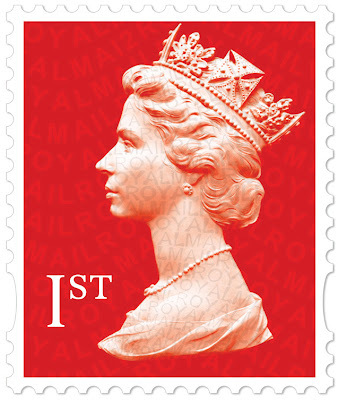 This is part of a large revision of all the colours used for the UK Definitive stamp in 2013. "We periodically revise the colours of the Definitives due to operational changes and technological changes in print, although we have not done this for many years. In the current colour palette certain colours produced similar readings when scanned in our Mail Processing Centres and some colours also caused difficulties in reading the phosphor bars." The new colours are £1 (Wood Brown) and the 50p (Slate Grey), 1st and 1st Large (Royal Mail Red). The colours of the other values remain unchanged though the Royal Mail iridescent overprint is added on all values, which means that the 1p, 2p, 5p, 10p, 20p (first issued as self-adhesive on 8 March 2011) will be new stamps. Given that the earlier 1st class stamp was described by Royal Mail as 'flame', I think we can assume that this will be a different colour - although the picture provided doesn't actually prove that! The 2nd class values remain unchanged. The remaining stamps in the range will have new colours introduced at the next tariff change. UPDATE 20 October: I see from an entry on the MachinMania blog that these new stamps were printed in September and have the M12L year code, except for the Large Letter stamps which are MA12. There has really been very little consistency regarding whether the year code indicates the year of printing or the year of issue, with some 'year' codes being printed as late as October of the previous year, whilst on occasion printings in January and February have had the previous year's code. It's not helpful! Business rolls of 10K only - does this mean we are likely to see another scarcity like MRIL MA10? It is probable that the usual consortium of dealers will buy a roll, and that the price for singles and strips will be much as before. It will be on a par with the original gold MRIL (2009 no year code) and the 2012 version which we have been selling. Presumably the new Post Office Red 1st class stamp will also make an appearance in the book of 4 x 1st plus 2 x London Underground stamps also scheduled for 3rd of January. The London Underground booklet will be out on 9 January, so we would expect the 'C' code to be in that - another Machin variant FDC. Just a quick comment on stamp rolls, are there any of the 'old style' coil stamp delivery machines still in use in the UK and if not am I correct to assume that stamp coils are produced for specific customers and not the general public. We discussed this locally; the vending machine in Dereham disappeared a few years ago. Although we don't have a Post & Go machine many offices which previously had coil vending machines do now have the more versatile Post & Go machines. It's probable that there are no vending machines left in POs. Stamp coils of 10,000 are produced primarily for direct mail companies - but anybody can buy them, at £6,000 each! Enfield Town Post Office still has a 'coil' vending machine inside the premises but has had a scribbled piece of paper stuck on it "Out of Order" for about 2 years now!! I did enquire of the counter staff, only to be told "don't know anything about it"
Thanks for these contributions - the Skelmersdale ASDA must be one of the last (I've asked PO Ltd via twitter). Next time you're there perhaps you could buy and let us know which security codes they have? 1st class is gold with no security overprint etc. Hi. I was really surprised to read about the coil machines in an ASDA franchise post office. In Whitley Bay the office moved across the road into a SPAR (now a Co-op)at least 1 years ago and the coil machine became (briefly) a booklet machine before that too disappeared. I thought at the time that it was policy not to put coil machines into a franchise, but maybe it depended on the franchisee? I'm amazed! What sort of booklets could have been sold in the last few years? The last machine-vended booklets were the 50p and £1. I think the last was produced in 2001 ! Salisbury main PO has coil machines dispensing 1st and 2nd class stamps also. As I was in Salisbury yesterday, I checked if the coil machine mentioned in the last post was still working. It is!! It has four buttons configured to deliver stamps from either one of 2 first class rolls or from one of two second class rolls. One of the first class rolls displayed "Sold Out" but the other three were working. The two second class slots delivered stamps from pre-security rolls (no overprint, no slits, presumably printed before 2009). The first class roll delivered an even older PIP design 1st stamp from about 2006. The stamps arrived looking a little "bent". When I purchased a 1st class stamp with a £1 coin, the machine even gave me 40p change. But I suppose I shouldn't be surprised! Coil machines are alive and well. The wealdstone office (near Harrow) has both a post & go machine (currently birds iv) and a coil machine (1st class Gold no security overprint, 2nd class PiP). Thank you for all your comments and contributions. I've been thinking about the stamps that are in these machines, and I think one or two of you may have got the chronology wrong. PIP started in August 2006, with the 1st & 2nd class gummed coils of 1000 issued on 3 October, and an earlier 2nd gummed coil on 15 August (this was either 500, 5,000 or 10,000). When the security stamps were issued in February 2009 the design for the small stamps reverted to the pre-PIP design, with the 500 & 1000 coils issued in May 2010. As far as I can recall there were no non-PIP printings between 2006 & 2009. - if they are non-PIP non-Security, they are from pre-PIP printings, ie before 2006. All of which may explain why there is no need to print short red coils. There was probably no need to print gummed security coils, had the existing stocks at POs been shared out among those which still had a use for them! If the year code on the new stamps is M12L, then even the RM mock-up you illustrate has got it wrong as here we see MA12!